Earlier I mentioned Jamie Shovlin’s Hiker Meat project. 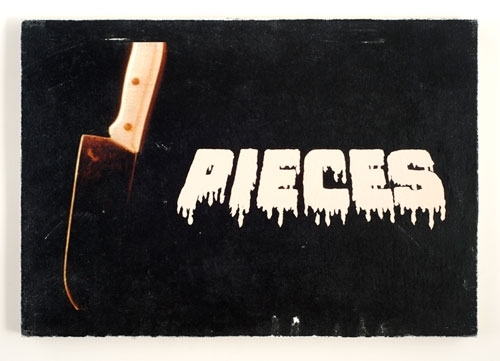 In the same slasher film vein, here is an image of Shovlin’s Index (Pieces A) that explicitly references that bloodiest movie about body parts, Pieces (Juan Piquer Simon, 1982). The image used is taken from the trailer. In addition to Index (Pieces A) I’ve also included the classic and clever poster for the film. A great synopsis on Pieces can be found here.